I’m enrolled in Microprocessor Applications this term. The MC68HC11 is what we are using to learn on. It’s an old chip. Very old. Motorola released it in 1985. That was the year I was born. As of this publication, I am 29 years old, nearly 30. Most of the people in my class weren’t even born when this chip hit the market. Ouch. The HC11 was originally intended to be used in mobile applications! When I say ‘mobile’, I mean ‘cars’. It’s actually pretty feature-packed. It has 38 GPIOs (16 bi-directional, 11 input-only, and 11 output-only). Onboard RAM, ROM, and the ability to access external ROM up to 64kb. You read that right: 64kb. It’s an 8-bit processor, and the crystal on the dev board is 8Mhz. For comparison, Intel released the i386 32bit, 12Mhz processor in 1985 as well. The i386 was top-of-the-line at the time. Meanwhile, the HC11 was being implemented in engine control units. In so many words, my professor told us that we should “crawl before we can walk.” Thus, we begin our journey into microprocessor programming with the HC11. Meanwhile, as I mentioned in an earlier post, I have an MSP430 that I bought LAST YEAR around this time. (Winter break has always been a mad rush of ideas and project starts. And, then all of that goes out the window when school starts again.) The MSP430 is a Texas Instruments product. You can get a starter dev board for about $10 here. It comes with everything you need to begin learning. But, the $10 version gets you a fairly featureless chip. 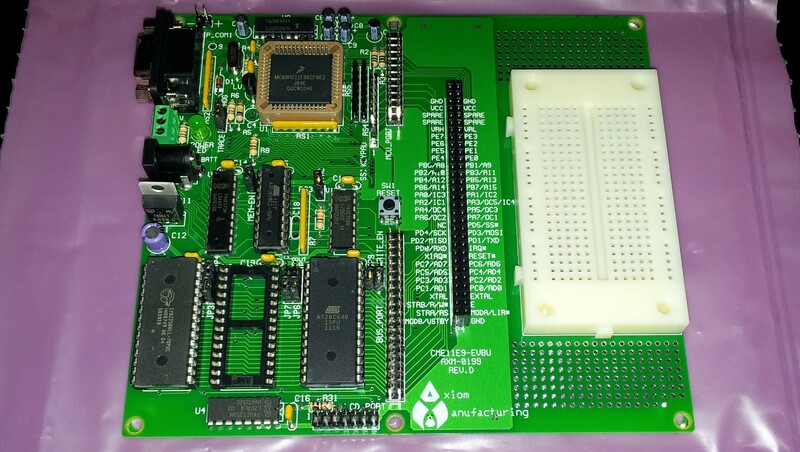 Meanwhile, the HC11 dev board costs $112. And, the book for the class costs about $350 new. TI has a proprietary IDE that lets you program in C. They also have an Arduino-style IDE that lets you program in psuedo-C. If you’ve never done any serious programming before, learn the psuedo-C and plan on transitioning to C later. But, if you’ve got some experience and/or you want to learn the nitty-gritty of what you’re doing, use C. For our Microprocessor Applications class, we’re learning to program in Assembly. I anticipate it will be difficult, but not impossible. We’ll see.